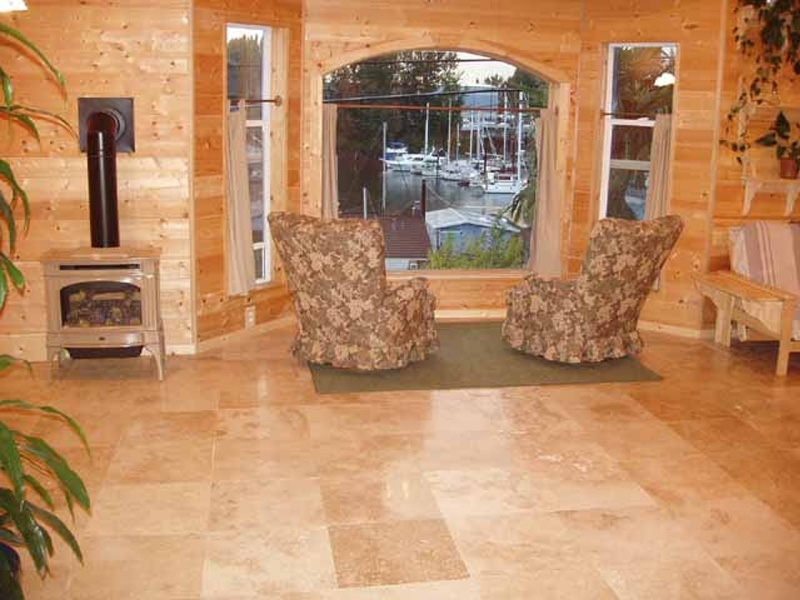 One of the types of stone professional installers are asked about quite often is travertine. Travertine has become popular in recent years as a more high-end, elegant stone used in slab or tile form. Travertine is a form of limestone. It is soft, and light-colored, with natural pitting. It comes in a sweeping array of natural hues such as tan, cream, salmon, and rust. It is softer and formed in a different way than other stones such as marble, so it has different properties and applications. Travertine can easily be polished, honed, tumbled or brushed for a variety of projects. Because it is a softer stone, it shouldn’t be utilized in heavy use areas unless it’s filled with epoxy resin and honed. In such a case when a slab of travertine is treated in this manner and created into a countertop, it is often mistaken for marble. Polished travertine will have to be double sealed, with a penetrating sealer and a barrier surface sealer. Once travertine is polished, it can be used in many places where the stone is a popular option, such as a tub surround, a niche stone, a backsplash, or other light use applications. Homeowners who select travertine countertops with a travertine backsplash are never disappointed. While they require regular care, the effect is stunning. However, when the travertine finish is left in a more natural state, it creates a gorgeous flooring tile, Honed, the natural dimples will come into play, creating a unique and exquisite texture on each tile. While travertine it will wear down over time, when it does so, it will do so in a very organic way which contributes to the unique character of it rather than making it look damaged. While it’s recently become popular due to new treatment techniques, use of travertine isn’t new. It was used to create buildings such as the Colosseum in Rome. The Tonto Natural Bridge in Payson is travertine, and the inside walls in the Sears (Willis) Tower are travertine. Because travertine is stone, it is heavy, especially as floor tile. Because if the weight, it should be installed by a pro who has had experience with it. As tiles or pavers, it can be used either indoors or out, such as when a homeowner wants a soft, lush look. If you’re considering travertine stone in a project for your home, such as a countertop, take some time to look at several colors and finishes. Once you use it in one project, you may fall in love with it and decide to use it in several more. By utilizing it in more than one setting, the travertine will create the continuity that is consistent with a well-appointed home.